Venice, the city of romance. It’s exciting, it’s magical. Venice is one of those bucket list cities that capture the passion and imagination of those who dream about travel. And this beautiful island city should be part of any Italy itinerary. The taxis and buses are boats and every turn seems to take you on a journey further and further away from reality. But it may just seem that way because you’re lost. I’ve spoken to a lot of people who have been to Venice, and like myself, it seems that every single one of them got lost while they were there! You need to get to Venice in order to get lost there, luckily, getting to Venice is an easy task that will leave you woefully unprepared for the maze of walking paths and rivers that make Venice so famous. Many visitors to Venice start their journey in Rome, but Italy in general has a fantastic transit system, so it’s not hard to get to Venice from almost anywhere in the country. Just beware that transit strikes are a common occurrence in Italy and they can hamper your transit journey. The most common way of getting into the old city is via train, which will take you into Venice’s old city. If you go this route, make sure you get off at Venezia Santa Lucia station and not Venezia Mestre station, which is on the mainland rather than the Venetian Lagoon. The train station is a fixture of WWII German architecture, cold, solid and imposing. Once at the station, you can walk outside and instantly be transported from the 1940’s architecture back into the 1800’s and below! If you are thinking of bringing your car into Venice, it might be a good idea to turn around and find parking. Venice limits automotive traffic to a tiny area of the city and life for those in an automobile just gets more frustrating from there. Parking fees are excruciating and there are just way better ways of getting into the city. If you are coming from the airport with a bunch of luggage, then the Water Taxi might be the best route into old Venice for you. The good thing about this method is that, because the roads are rivers, a water taxi can take your right up to the door of your hotel. Along with being the easiest route, this way gets you a decent first tour of the waterways! Taxis can be booked on arrival at the Consorzio Motoscafi Venezia or the Veneziataxi desks in the Arrivals Hall at Marco Polo. Exploring Venice is best left to the directionally challenged. No matter how great you are at following a map, reading a compass or navigating the stars you will eventually find yourself completely and utterly baffled as to where you are. 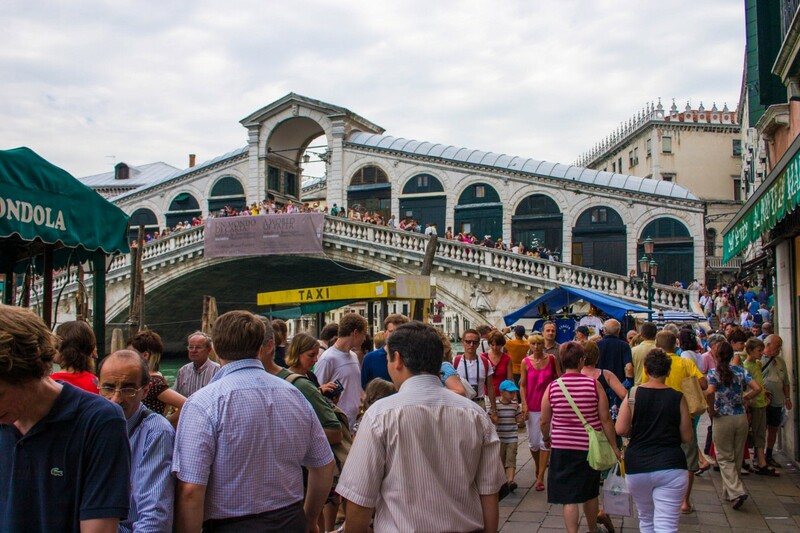 In Venice, the more unfound you are, the better your experience will be, because being misplaced here is how you discover all the amazing nooks and crannies that Venice has to offer. Now getting lost in Venice isn’t the first thing you want to do. You need to hit your main points of interest first. 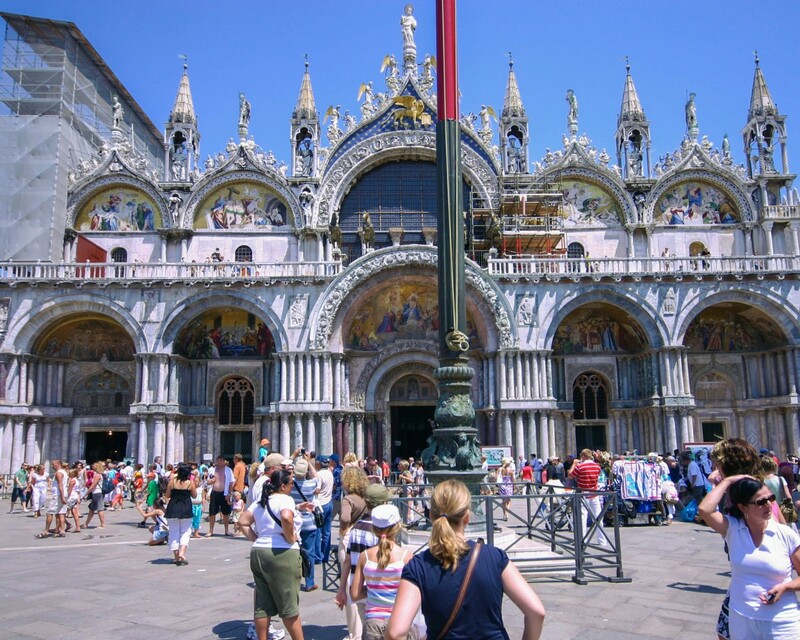 Get to St. Mark’s square, visit Doge’s Palace and St. Mark’s Basilica and try to get to the Bridge of Sighs. 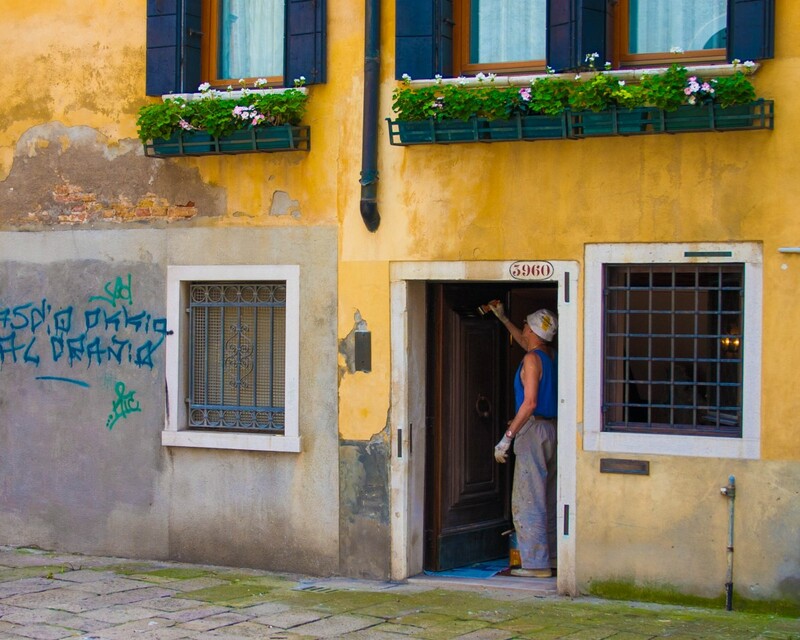 Get your Venice photo tour out of the way first, because you want to enjoy your descent into the unknown, and it’s hard to do that if you have important items on your agenda that you are worried you won’t make it to. If you are willing to venture away from the main sites of Venice, you don’t need to worry about getting lost. Venice will take care of that for you. The streets wind aimlessly with the rivers and you can often be faced with a situation where you are at an intersection with two signs pointing in two separate directions and both are trying to lead you to the same place. A sure-fire way to get lost in Venice is to look at the crowds of people hitting the key sites and go anywhere but there. Once you’re away from the crowd and slightly lost, you can improve your locational disability by then trying to get somewhere you think you’re supposed to be. If you’re like me, this will lead you to try and logically sort out your position and try to find a familiar place that you’ve been. Once you’ve wound yourself around in circles and discovered you are anywhere but where you thought you were supposed to be congratulations! You’re lost in Venice! Pro-Tip: In Italy, it costs more to sit down and have your coffee than to stand at the bar. If you need to take a load off, be aware that it comes at a price. So now that you’ve got yourself lost in Venice, what should you do, where should you go? Don’t ruin it by looking at your watch. The St. Marks Square clock will ring on the hour. And you’ll be able to track your time, so just put the phone and watch away and enjoy the view. The answer to where should you go is obvious. You’re lost, so you can’t go anywhere you want to go, you can just go to where you end up. Being lost in Venice means getting a chance to sit down and have some of the best coffee in Italy. You can capture all those little moments that many visitors never get the chance to see. You can now see what the tiny number of people who call Venice home do with themselves. Discover the small shops hidden down the deep alleyways off of the tourist paths, the locals painting their doors and the beautiful flower arrangements in many window sills. If you get tired, find one of the many quaint cafes and grab yourself an espresso at the bar. You can mix it with a nice chocolate croissant, our favorite combo. Getting lost in Venice is an intimate experience. One that will be unique to each and every person who experiences it. Each lost in Venice experience will be your own. And the discoveries you make will be shared by only a select few. So it’s getting late, your feet are tired and you’ve had all the adventure you can handle for the day. It’s time to get found in Venice. So how do you do it? One option is to hop onto one of the Venice public transport buses. Just notify the boat personnel when you board in case they do a spot-check for tickets. You don’t want to end up with one of the high fines for jumping fares. You can always ask a local. You’ll recognize them by the lack of camera gear and maps. Another option is to look up. Use the tall towers from St. Marks Square as a way-point. They sit high above the surrounding buildings and can be seen from most squares within the city. 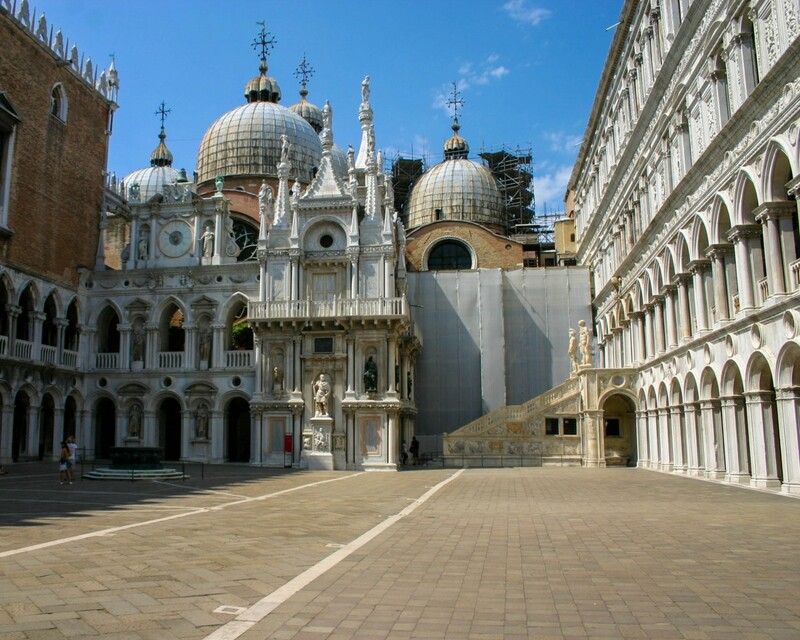 Whether you plan on visiting the Venice Carnival, or during the off-season, you will be entranced by the city’s beauty. It’s romance, and charm will woo you, just like the thousands of visitors that grace it’s street’s each year. Be sure to let it draw you in so you can take some of its magic with you forever. Very interestingly informative piece. Loved reading it. Thanks …..I liked the pics too. I am going to Venice for the second time in August and cannot wait to get lost down the gorgeous alleyways. Thanks for the reminder re the train station! Venice is almost mystical for me. The history, the carnival, the canals, everything! Great post, just makes me want to go even more 🙂 Ready to get lost! I have been to Venice twice and not gotten lost. Evidently I did Venice entirely wrong. I will now have to return. Very nice post. Enjoyed the photos and the narrative. Thanks for sharing. Haha love this and it’s so true! I pride myself on my inner compass that always manages to find my way no matter where I am but the last few years of travels have disproved this, especially in Venice! I love the signs pointing you “Per Rialto” and “Per San Marco”. Very useful but I agree, you gotta just let go and get lost! I enjoyed your style of writing! I was able to imagine myself in Venice getting lost. I love that you mentioned putting the phone away and not looking at your watch. Really allowing us to enjoy the moment and what surrounds us. We collect masks, and Venice was the perfect spot to add to our collection! I’ve only been in Venice as a kid, but after reading this I’d like to go back now! I always think of Venice as a surreal and mystical place. I remember the first time I went. We were in a motorhome and we drove over the bridge onto the lagoon area. I had always thought of Venice being an island, not connected to land for some reason, so this was my first revelation! I took my Mum and Dad there years later and can still remember the look on Mum’s face when she saw it and as she was being ferried around on a gondola. A truly magical city and you have captured the essence of it so beautifully with your photos. Nice work. Venice always looks beautiful in the pictures. I went to Venice in 1999. St Marks Square was beautiful but the canals were dirty when I went on a gondola. Ah yes, we loved getting lost in Venice also! We repeatedly got lost at the same corner and ended up eating 1-3 slices per day of this incredible Pizza in this authentic little corner store / pizzeria. We rented an apartment right in the city centre. We’d love to go back to Venice and explore the city in more detail and I’ll keep your recommendations in mind! Sounds like an amazing time! And I know the feeling of being lost in the same place over and over and over again all too well! I’ve always wanted to go back to Venice and see it properly. Last time myself and some friends were passing through after being in a festival in Trieste and thought we’d easily find budget accommodation which turned out to be harder than we thought. With barely a penny to our name we ended up camping out on the streets of Venice! Not the highest point in my life but I suppose in a sense we “got lost”! This article has certainly highlighted all the wonderful things we did miss out on. Venice isn’t known for its budget accommodations, although we did stay in one of the cheapest places there when we went (due to a transit strike stopping us from leaving) and even though the lady was super apologetic as to the quality, it was still the nicest place we stayed at on our backpacking trip through Italy. Very informative post, and great pictures! Venice is on my list, and I can’t wait to go!! 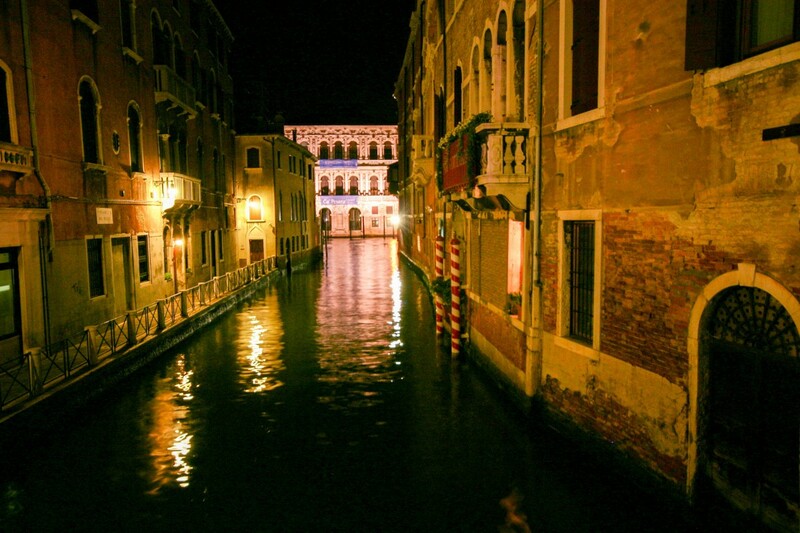 Great post Kevin – getting lost in Venice is the ONLY way to go in my mind. We found all the best restaurants and shops walking the narrow streets off the main attractions. They’re more attentive and relaxed. I just can’t handle crowds. Our boys loved Venice! Such an interesting city! We spent the entire weekend getting lost and eating gelato! We hope to go back soon. Looking up really is the best way to find your path in Venice… unless you got into the network of tight alleyways and tiiiiiny canals in the northern part of the city, because then your only hope is help from a person. Gosh, I love Venice! Haha loved this post and totally agreee with getting lost: I tend to do it (on purpose) wherever I go and Venice is one of the very best places for it. And I agree about stopping for food in smaller, more local places, they are always the best! Loved reading this post. It sounds like Venice is my kind of city. I’m ‘directionally-challenged’ so I guess I will feel right at home. Your recommendations to look for the landmarks is very helpful. Haven’t been to Venice yet, but it is on the list. Great pictures. I think I did Venice for 3 days and definitely got lost! Would love to live here and have my own speed boat! Thanks for sharing some fantastic tips! We got lost in Venice too 🙂 We eventually asked a mail man for directions. The funny thing was that we kept running into him and he kept saying that we took the wrong bridge or the wrong turn 😀 It became hilarious! But, we also had a very positive experience while getting lost: a man rowed by on his sandolo (the little brother of the gondola) and offered us a free boat ride on the canals, which was amazing! What a great experience! When we were there we kept making the same wrong turn over and over again, but from different angles. 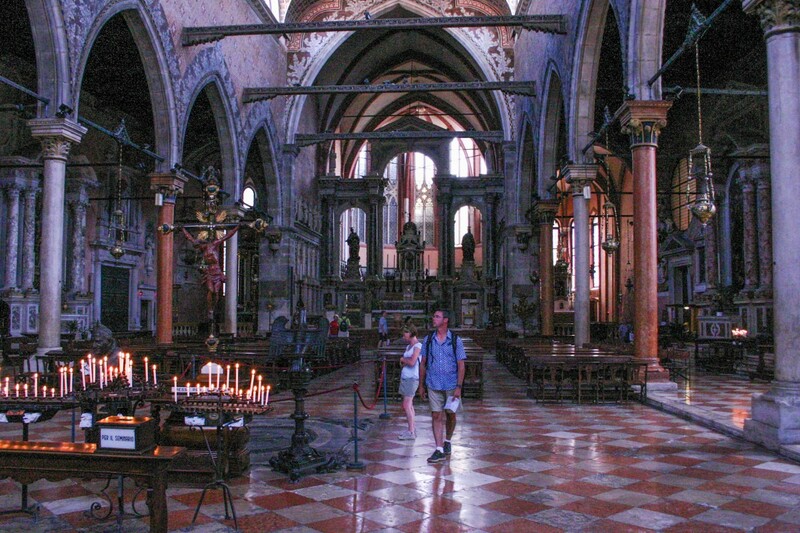 I absolutely love Venice, and St. Mark’s is by far the most impressive cathedral I’ve ever seen. We visited for the first time this past winter… such a nice time to be there. I loved reading your post and reminiscing! Thanks so much Kathrin! I definitely hope you get to visit again! I’ve never been to Venice but it’s definitely on my list. I love architecture and seeing that there’s no shortage of beautiful buildings, I will for sure enjoy getting lost in Venice! I love this article! I haven’t visited Venice but after reading this, I’d say it’s definitely somewhere I’d like to get lost one day! I have always wanted to visit Venice (and knowing me getting lost would be no problem at all!!) but I have been put off by the high cost of living once you get there. Was food and drink as pricey as expected? Right in the old city food and lodging was fairly expensive, however, there are alternatives, such as buying food and getting a hotel in Venice proper (on the mainland) and bringing it with you. I love everything about this! Venice is high on my list. And I love the idea of getting lost in a city and really delving into the culture like a local. Interesting read. I’ve never attempted to get lost in Venice, but I can see the appeal. I loved the post and will have to take your advice when I’m back in Venice! This is fun post! Visited Italy several years ago but did not make it to lovely Venice! Thanks for the useful tips on how to get there – and how to get in-lost! Sounds like there are wonderful things to be discovered. Your photos are very enticing. Venice is a nice and safe place to practice getting lost. Very simple to get lost there. Just keep taking different little streets. Getting un-lost is also easy. Keep walking until you reach the water or see some landmark. Fun stuff. Nice post! We definitely agree that the best way to visit Venice is by getting lost. A few years ago one of our authors visited Venice and she loved all those tiny streets, cafés, local handycrafts etc. rather than the big tourist sights. Thanks for sharing! Italy is on my list! I enjoyed reading your post, and will take your tips to heart when I finally get there! Thanks! This is my first time visiting your site, and I have to say, the design is absolutely stunning. I love your comments about getting lost and then un-lost in Venice. That was my favorite part about visiting the city! Wow! Venice is still on my list. It looks so nice through your photos. I always get lost (not on purpose) in cities. So let’s try to do that too in Venice. Thank you for sharing those pictures! Really nice and different post about Venice. I’ll sure try to get lost when I visit next time. Last time I was a child and just following my parents lead. I would’ve never thought to take the water taxi into the city from the airport. Thanks for the tip. Venice is virtually impossible to navigate. We got sooooo lost wandering the streets of Venice as well. Instead of moaning, we enjoyed the whole experience and had a bottle of wine to boot as we wandered around. Great tips on how to get un-lost! Definitely loved your creative way to portrait Venice! Looking forward to be there soon. Thanks for sharing this! I would totally love to get lost in Venice! I have never been to Venice, and would love to plan a trip there soon. I’d absolutely love to get lost in Venice, as long as I’d eaten plenty of pasta beforehand! Wow! Venice seems mystical and interesting. Thanks for the tips! Will be bookmarking this for my Euro trip soon. Should be titled how not to get lost in Venice haha. As usual I love the photos on your post, would love to know how you arrange them so nicely together? I just love Venice! As you say – it’s really easy to get lost. I only get sense of orientation after like two months living there. So many people say Venice smells etc – for the, it’s the prettiest Italian town! Lovely photos, with some great tips on exploring the city. Getting lost was definitely one of my highlights. Nice post guys. We recently visited Venice again and would have loved to bring back some masks, like yourselves but couldn’t due to travelling light and air ticket limits. Maybe next time. Still Venice in the winter is so quiet. And yes it is always magical. Thank you very much! I hope you get there soon! WoW that’s amazing, I can see you had great time there. i been to milan and had good time there. looking forward to visit venice and got an idea what things i can do. I loved walking the rooftop of the Milan cathedral. Thanks for the memories! Absolutely! There’s nothing like discovering little nooks and crannies and getting away from those guide books.